More often the question arises as to what kind of Pantone colour corresponds to the HKS 43 K. Or what CMYK value? And what kind of web color in RGB? If you own Adobe Photoshop, you can do these conversions directly there. 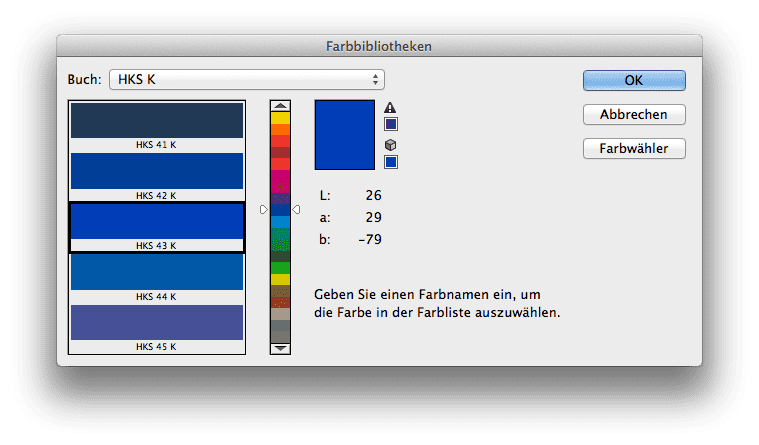 In Photoshop CC all well-known color books are stored with values. 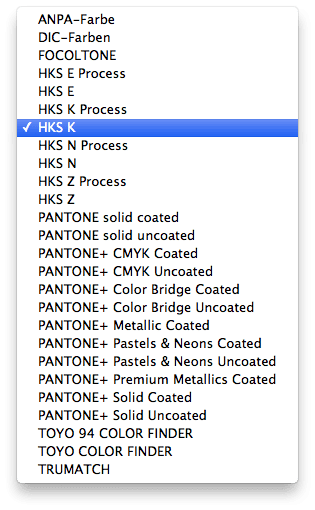 Let’s assume we are looking for the Pantone equivalent and the matching CMYK color of HKS 43 K.
1: Open the color palette in Adobe Photoshop and select HKS K as the book and then the color HKS 43 K. All well-known colour books are directly stored in Photoshop. 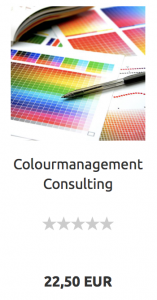 Why monitor and paper don’t get along when it comes to color. Colour is colour, you’d think. That’s right. But have you ever tried to explain the colour of your new car or your new red wallet to a friend on the phone? You will notice that human color recognition and the reproduction of the same in another medium is very difficult. The same applies to computers – better: monitors, and printers – i.e. : laser printers, inkjet printers or newspaper printing or offset brochure printing. A monitor adds light, i.e. spectral components, to the existing ambient light. If you see red on a monitor, it is because the monitor actively emits red light. And now the paper: When do you see red on paper? Exactly when white light falls on the paper, for example through a window or a lamp. And when do you see the color red on paper? When white light falls on the paper and the paper extracts the non-red spectral components from the white light and reflects the red light. That’s when you see the color red. One colour, two completely different ways of production. And this is exactly where the color calibration and the proof start. The strategy? Fairs. And this under fixed conditions and not with the human eye, but with “incorruptible” technology. Put simply, a monitor calibration device can measure your monitor and see exactly “how much” color your monitor can display, and “how wrong” your monitor can display color. And if your computer knows that, it can correct the monitor. If the computer knows the color representation of the monitor and printer, it can correct and adjust the representation so that both correspond to the same color. Of course, this only works if the color and brightness of the light that illuminates the paper is also known and standardized. If a computer also knows that the final printed product is to be printed in offset on an image printing paper, and it knows the colour representation of this printing process, then it can simulate this on a monitor and on an inkjet printer. On the monitor, this color-accurate representation is a so-called “soft proof”, the color-accurate preview of the subsequent print on the inkjet printer is called “Proof” or “Contract Proof”. This inkjet printing must be very precise and meet the highest demands in gamut and color simulation. And since the image processing technology, color matching calculation and measuring technology behind it is not very cheap, proofs are still mostly “expensive” inkjet prints. Due to new printing systems and inexpensive and better measuring technology, however, prices have also fallen significantly here in recent years.